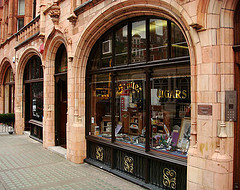 Opposite the charming Connaught Hotel in the effortlessly chic Mount Street stands one of the great cigar stores of London: Sautter. Back in 1963, Desmond Sautter set up this cigar haven and decided that, to satisfy the demands of the many American customers who wandered across the road from the grand hotel they loved so much, he would install London’s very first ‘walk in’ humidor. American cigar smokers, many of whom lived in arid states, were used to keeping their cigars damp and turned their noses up at the British habit of keeping their cigars dry. Sautter built up a large and loyal clientele from both sides of the Atlantic and discovered that London had many hidden pockets of old Cuban cigars which were treasured by aficionados all over the world. Over time he built up a stock of rare cigars, many of which were sold through auctions at Christie's as the world became educated in the delights of this rare exotica. Sautter maintains its reputation for having a wonderful selection of aged and special cigars. As a specialist store customers are able to sample cigars on the premises. As the store approaches its 50th anniversary, Londonist calculates that the staff themselves have over one hundred years of experience in the business. So you could do worse than to put yourself in their hands whether you are a beginner or an old hand. Sautter is located at 106 Mount Street (W1K 2TW). Visit www.sauttercigars.com for more information.